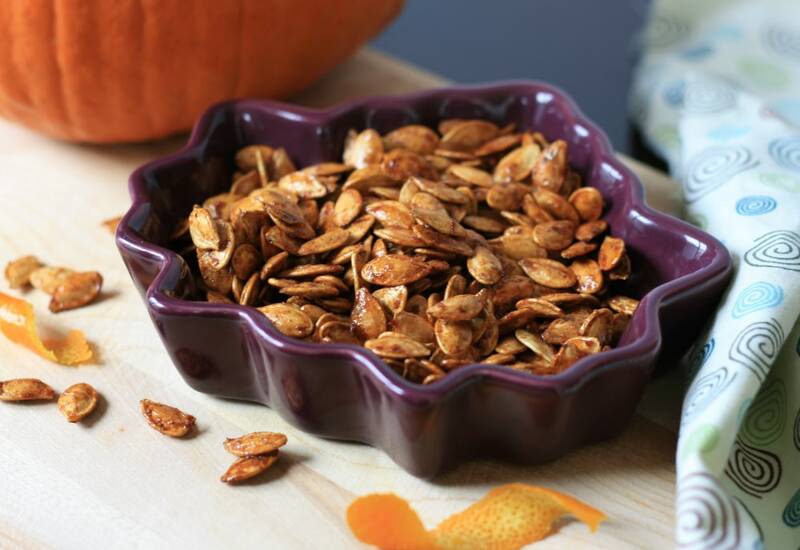 Don’t throw away your leftover pumpkin seeds - turn them into a healthy snack. These crunchy seeds with a hint of orange-cardamom will satisfy your sweet tooth. The smell alone will keep you coming back for more! The air fryer makes them super crispy and you don't have to use a lot of butter. Seeds may stick together upon cooling. Break apart before eating. The shells are not only edible, they are packed with fiber. A 3.5 to 4 pound pie pumpkin will yield about 1 cup of seeds. These are great as a snack, sprinkled on a salad or as a garnish on pumpkin soup and are especially tasty right out of the fryer while still warm. Per Serving: 109 calories; 6g fat; 11.6g carbohydrates; 3g protein; 8mg cholesterol; 90mg sodium. I cleaned, rinsed and dried the seeds the night prior so all I had to do with put them in the air fryer. These are my and my kids favorite snack in the fall. The cardamom and orange twist was new, but we loved it. Especially the warm brown sugar. I've never experimented with pumpkin seeds outside of seasoning them with a little salt. I'm so glad I tried something new! They turned out crispy, and cooked evenly. Great to snack on and minimal cleanup.